Read our full review of the new Fujifilm X-T10, the entry level mirrorless camera from Fujifilm with classic DSLR styling. The Fujifilm X-T10 is a brand new mirrorless compact system camera from Fujifilm, that features classic SLR styling, with a built-in electronic viewfinder (EVF), and is like a mini X-T1, priced at £499 body only, £599 with XC16-50mm kit lens, or £799 with 18-55mm kit lens. 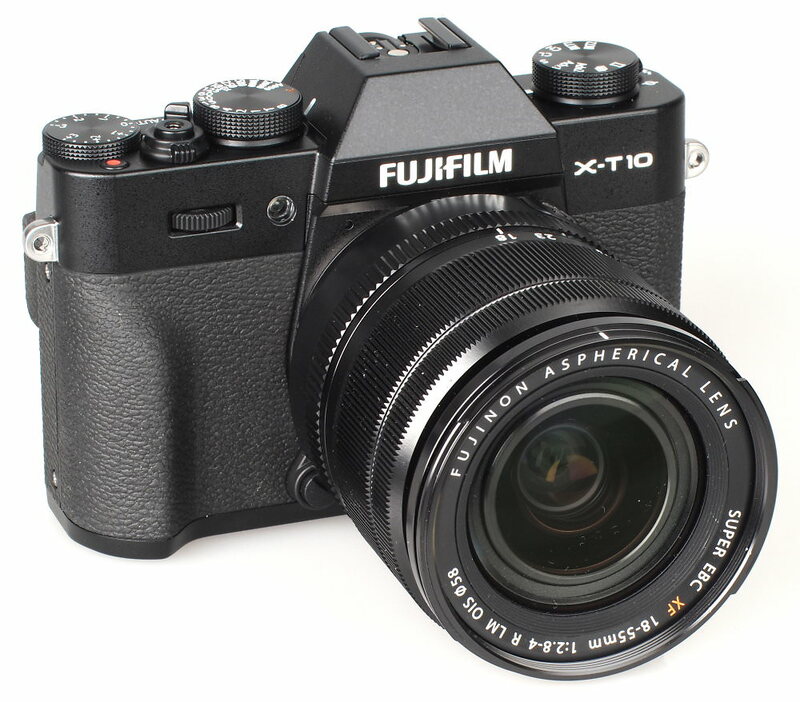 The X-T10 is available now, in silver or black with all kit lenses being black. 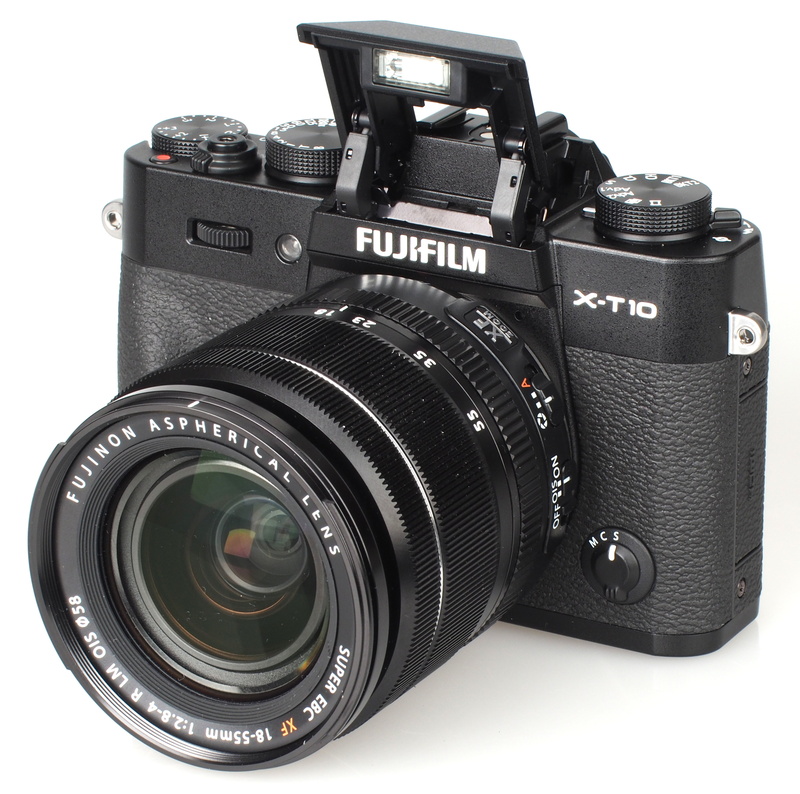 The X-T10 has been introduced with a new Fujinon XF 90mm f/2.0 WR lens. The camera uses the same 16.3 megapixel APS-C X-Trans CMOS II sensor as the X-T1 with built-in phase-detection focus. This new camera, the X-T10, features the same focus improvements that have been introduced in the latest firmware update for the X-T1, which includes: Face detection with eye detection, wide-area tracking, and zone area focus. The X-T10 features Fujifilm’s conventional 49-point AF mode for high speed and precision focusing, as well as new Zone and Wide/Tracking modes that track subject movement across a larger 77-point area, significantly improving the camera’s ability to capture moving targets. Like the X-T1, the X-T10 features 8fps continuous shooting with continuous auto focus. The X-T10 features a high-resolution 2.36m dot electronic viewfinder (EVF) with a fast refresh rate, using a 0.39inch display, with 0.62x magnification vs 0.77x magnification on the X-T1. The rear screen tilts up and down, like the X-T1, but has a slightly lower resolution of 920k vs 1040k on the X-T1. 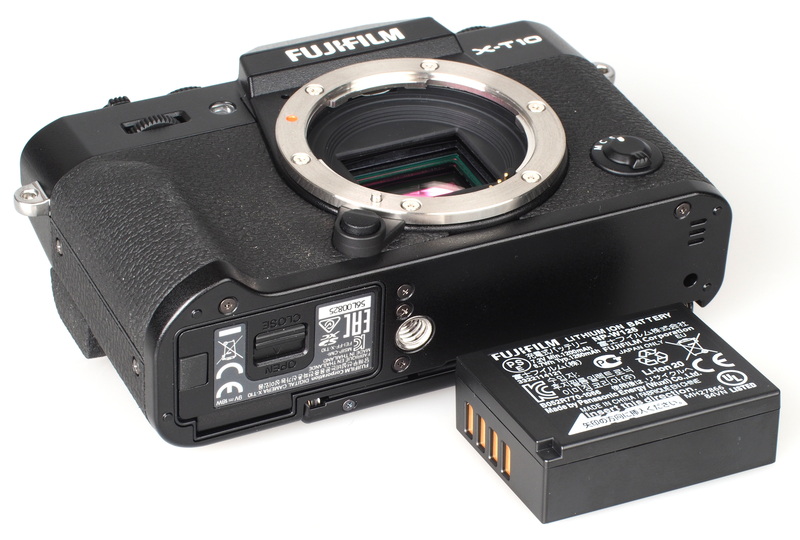 The X-T10 is more compact than the X-T1 with a body measuring 118.4mm (W) x 82.8mm (H) x 40.8mm (D), and weighing approx. 381g (including battery and memory card), compared to 129mm x 89.8mm x 46.7mm and 440g (inc battery and memory card), for the X-T1. The camera features top and base plates made of die-cast magnesium, as well as high-quality aluminium dials, but the camera is not weather sealed. To make the camera easier to use the X-T10 features an Auto mode lever that can be used to quickly switch the camera into fully automatic mode, regardless of what settings are on the dials, which will be useful if passing the camera to someone else to use, or for when you quickly want to capture a moment without having to check the settings on the camera. The X-T10 looks good and feels well built with a large (squishy) rubber thumb grip at the rear, and a good sized grip at the front for your right hand. The grip can be extended further with an optional grip that is also available. The camera also features front and rear control wheels, plus a front switch for focus (Manual, Continuous, Single). The top dials from the left: the first lever is to release the pop-up flash, then there is the drive mode dial, with options including panoramic, multiple exposure, Adv1, Adv2, Single shot, continuous low, continuous high, bracket 1 and 2. Next is the flash hot-shoe. Shutter speed dial, which can be set to A (for Automatic), plus a new Auto switch, which can be used to switch the camera into completely automatic mode, where the camera will automatically recognise the scene and set the camera settings appropriately. On/off, shutter release, exposure compensation and video record button finish the top plate. It looks like the only dials missing compared to the X-T1 are the ISO and metering dials, although there are less function buttons as well, with just one featuring on the back. On the rear of the camera (starting from top left) you'll find: Delete and playback buttons followed by the EVF with eye detection sensor and dioptre correction. 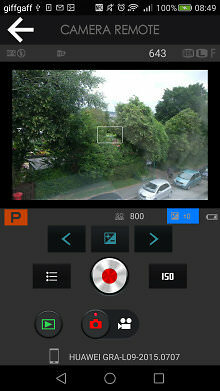 There is also a view mode button to let you manually set whether to use the screen, or EVF. Other buttons include AEL, a command dial, AFL, Q button, Menu/OK button surrounded by 4-way controller, display/back button and finally the Fn (function) button. The screen is good, although when using the X-T10 outdoors in bright sunlight, the electronic viewfinder becomes very useful as the screen becomes more difficult to view. The resolution of the electronic viewfinder (EVF) is very good, but we couldn't help but feel that the view is a little small, as the opening to look through appeared quite small compared to other cameras we had to hand. 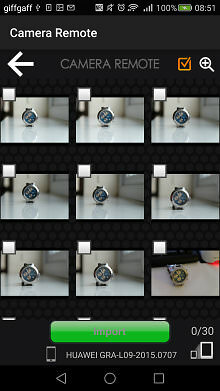 The macro button is no longer needed, as the focus system will automatically switch to macro focusing when needed. On the left of the camera body, there is a Mic / Remote (2.5mm jack) socket, but no flash sync socket. 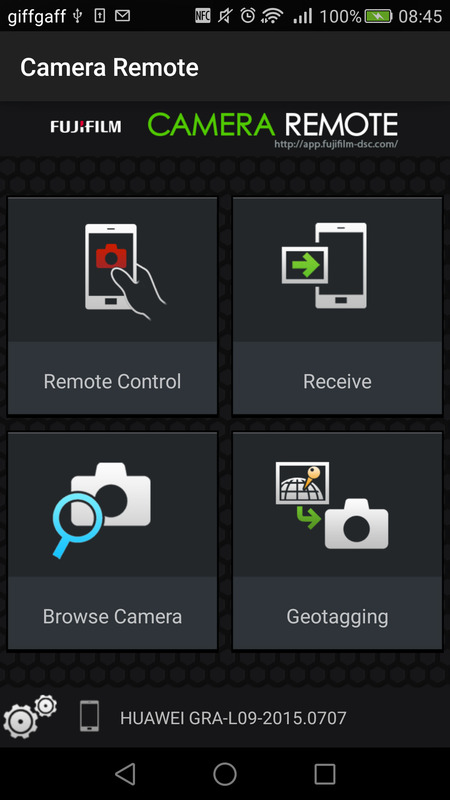 Wi-Fi features - You can shoot remotely using Fujifilms Remote Camera app available for iOS and Android devices, and this lets you remotely control and shoot with the camera as well as start/stop video recording. You can select photos to transfer to the smartphone or tablet, or receive photos sent from the camera. 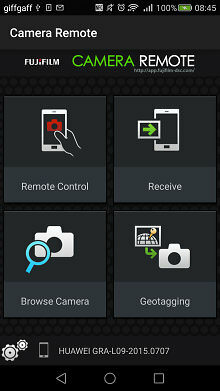 In addition, you can use the app to add GPS / geotagging information to photos. The app is quite easy to use and has a good level of options when shooting remotely. Battery life - Battery life is rated at 350 shots according to Fujifilm / CIPA test results, which is good for a mirrorless class of camera - although we would recommend a spare battery if you plan on shooting more, and extended use of Wi-Fi and flash is likely to drain the battery more quickly. The memory card and battery compartment can be found underneath next to the tripod socket, which is not centrally aligned. When shooting with continuous AF tracking active the active focus area becomes much smaller, compared to the normal focusing mode which covers a wide area of the image. Tested with the 18-55mm, f/2.8-4 OIS lens. Sample Photos - Portrait photos taken with flash show low levels of red-eye, particularly in the auto mode where the camera automatically selects the best settings for you including red-eye reduction flash. Exposure is reliable with the camera taking bright colourful photos, in a variety of shooting conditions, and results are very pleasing with good levels of detail straight from the camera, even when shooting JPEGs. Dynamic range is good, and this can be extended by using the Dynamic Range setting, or shooting raw. Lens Performance - Images show good levels of detail whether shooting at the wide-angle end of the lens or the telephoto lens, and the 18-55mm f/2.8 lens performed well in our full review of the lens. Built in optical image stabilisation helps get shots in low light or when using the zoom. Macro performance of the 18-55mm f/2.8 lens isn't the best, and for better results a dedicated macro lens is recommended. The lens is quite resistant to flare and there is minimal barrel and pincushion distortion. Image quality benefits from the Lens Modulation Optimisation built into the camera to deliver sharper photos when a smaller aperture is used. ISO Noise Performance - Noise is low with excellent levels of detail up to and including ISO1600. Detail remains good at ISO3200, but drops off slightly at ISO6400 as noise increases. ISO performance is impressive at high ISO settings, with good results at ISO12800. ISO25600 may even be usable in some circumstances, although ISO51200 is best avoided. The extended ISO range includes ISO100, ISO12800 and above, and it's not possible to shoot RAW with these ISO settings. White Balance Performance - Auto White Balance (AWB) performs well with a very slight colour cast under tungsten lighting, with the tungsten preset giving a slightly more accurate result. AWB performs very well under fluorescent lights, with the fluorescent preset giving a magenta colour cast. Digital Filters - There are numerous film simulation modes selectable, and the camera will also record the RAW file making it easy to go back to the standard version. When shooting using one of the advanced filters the camera only records JPEG files. Panorama mode - The camera features an automatic panoramic mode, where you simply press the shutter release button and pan the camera from one side to the other. Results are very good, and well stitched together, with a fairly high resolution image produced. Video - Movie options include the ability to set the ISO speed manually from ISO400 to ISO6400, or leave the camera on Auto ISO. You can also adjust the mic level, however there are only four settings from 1 to 4. The resolution and frame rates available are fulHD 1920 x 1080 at 60, 50, 30, 25 and 24fps. Video quality is good, although for best results a tripod is recommended. The Fujifilm X-T10 is a more compact, more affordable version of the highly acclaimed Fujifilm X-T1, and with the same image sensor and image quality as the X-T1, the Fujifilm X-T10 is an excellent performer. The X-T10 benefits from advancements made to the focus system and shoots at the same 8fps with continuous auto focus as the X-T1. The X-T10 is smaller, has a built in flash, and costs less, whilst still maintaining excellent controls giving direct access to shutter speed, exposure compensation and drive mode, making the camera a joy to use. Whilst the electronic viewfinder is smaller than the X-T1, the EVF has a very high resolution of 2.36 million dots, and looks excellent with bright vibrant colours. The Fujifilm X-T10 is an excellent mirrorless camera, and would make an excellent choice for those looking for high image quality without the size and bulk associated with the typical Digital SLR. 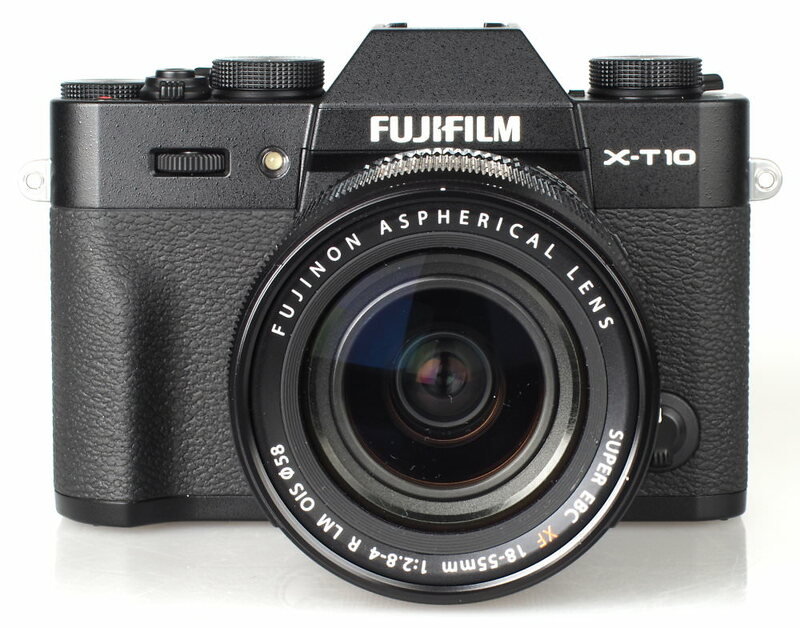 The Fujifilm X-T10 delivers the excellent image quality of the X-T1 in a smaller body offered at an excellent price. Whenever I think about a camera systems, I always believe you should judge it but the lenses in the system rather than the cameras, as cameras tend to be updated quickly and drop in price, but lenses tend to arrive more slowly and keep their price better. And that's my problem with Fuji, you can get the body's really cheap, but the lenses are just too expensive, and the selection of 'affordable' lenses is just too small. If money was no object I would probably buy a Fuji, but it is so ill keep with micro four thirds for now. I am sure I have ranted about this before, but there must be a lot of people who bought into the system, only to realise all the lenses they want are out of their budget. What Fuji really needs are the Sigma DN lenses. Whenever I think about a camera systems, I always believe you should judge it but the lenses in the system rather than the cameras, as cameras tend to be updated quickly and drop in price, but lenses tend to arrive more slowly and keep their price better. And that's my problem with Fuji, you can get the body's really cheap, but the lenses are just too expensive, and the selection of 'affordable' lenses is just too small. If money was no object I would probably buy a Fuji, but it is so ill keep with micro four thirds for now. I am sure I have ranted about this before, but there must be a lot of people who bought into the system, only to realise all the lenses they want are out of their budget. What Fuji really needs are the Sigma DN lenses. I have been very curious for some time about the sample images that I have seen that have been taken with both the XT1 and now the XT10 - the blacks are so black that there is no detail at all in them. I have 'captured' a couple of instances and even when you move the black, shadow and exposure sliders in ACR to the far right the blacks still have no detail. This is to me so alien that I have written to Fuji for a reply. Their reply seems to suggest that they are happy with this situation. As a very keen amateur I would not buy one whilst this is the case. I like to be able to open up the shadows in an image to give a hint that there is something there and any images that I take for which this is not possible then they are scrapped. Has any one else noticed this? I would be interested in knowing what professional photographers make of it. Am I just being rather too 'precious'? Great review, thanks - and the excellent product shots show how handsome the black version is, which tones down the extremely "retro" appearance that the high shoulders of this design gives it in the silver variant. I have this one in black (unsurprisingly) and also an X-T1 with the new firmware and largely agree with the review - though the X-T10 actually has one MORE, not less, function button than the X-T1 as it has seven customisable keys versus six (the rear panel Fn button equates to the top deck one on the X-T1, and the X-T10 combines the separate buttons that the X-T1 has under the front and rear dials with the dials themselves, as they have a push-to-engage action for those functions). One could argue that the X-T10 needs this extra customisable button facility, since ISO is an obvious one to allocate, as it lacks the physical dial for ISO that the X-T1 has (some would argue that it is a good thing to lose, though!). I agree that the small exit pupil of the X-T10's EVF and the lower magnification makes it seem a little on the small side, especially compared with the extremely large version of the X-T1. The X-T10's EVF has a new feature, auto-brightness (which can be overridden if desired) - I find that it defaults to a view a little on the dark side for my preferences. It's worth noting that despite its rubber-like appearance, the X-T10's viewfinder "eyecup" (which is very shallow) is in fact hard plastic (it's just finished with velvety, "soft touch" varnish) and has no way of attaching an alternative eye cup. The X-T10's viewfinder and LCD graphics are different to previous models such as the X-T1 - fonts are generally smaller (which is perhaps a slight problem with the EVF) and the main data displays more horizontal, with pop-up menus less prone to cover as much of the scene. On the other hand, the amount of data shown on the data-only display of the LCD and the most detailed playback display seems slightly more comprehensive than its predecessors. I find the X-T10's jpgs seem to be exposed up to around a stop darker than the X-T1 (at least for my examples), which gives quite attractive results - it seems to be a difference in the way the evaluative meter is tuned. Like the X-M1 and X-A1/2, the X-T10 adds options to the operation of the stabilisation system of motion detection if required, a feature which doesn't appear on "higher" models like the X-T1. The X-T10 also, handily, has THREE individually customisable Auto ISO settings, versus one on the X-T1. On the other hand, compared with the X-T1, I do find that the X-T10's pressable front and rear dials feel rather fragile - they have a very light action indeed which can be a little indecisive, sometimes turning when I only meant to press. The continuous/tracking AF target group becomes smaller in both cameras because that is where the PDAF detection points are on the sensor. 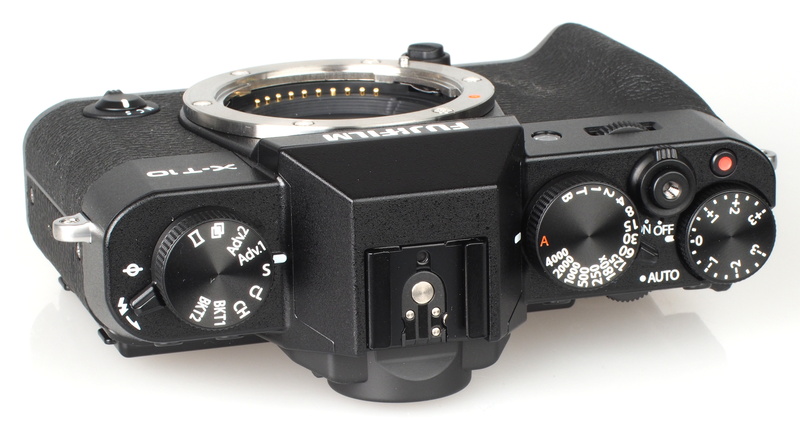 Both the X-T10 and the X-T1 when using the new firmware version 4 allow us to set shutter speeds the "other" way as an alternative to the physical shutter speed dial - you can turn the shutter speed dial to T and set the shutter speed, through the entire range, with the front or rear dial, as you prefer (swappable in the customisation). This way, you can use the camera in shutter priority or manual mode more in the manner of cameras which have P, S, A, M mode dials in place of shutter speed dials and aperture rings, which can be faster than the traditional manner of using a shutter speed dial - and many people are used to the more modern manner these days. This is a nice inclusion. The X-T10 also has that instant full-Auto switch under the shutter speed dial, which can be handy, particularly as getting back to program or aperture priority mode takes longer on the X-T10 - because it does not have a lock button on the shutter speed dial, it does not turn through the gap between the red A position and the opposite end of the shutter speed range, B. This means that to use the front/rear dial mode of setting shutter speeds, you need to turn the shutter dial through 15 firm click stops first to get to T, and 15 back again to get to A when you have finished. Conversely, the X-T1 has a fully-rotating shutter speed dial with a lock on the A position, meaning that this manoeuvre takes only two click stops in either direction, whilst holding the lock button. Great review, thanks - and the excellent product shots show how handsome the black version is, which tones down the extremely "retro" appearance that the high shoulders of this design gives it in the silver variant. I have this one in black (unsurprisingly) and also an X-T1 with the new firmware and largely agree with the review - though the X-T10 actually has one MORE, not less, function button than the X-T1 as it has seven customisable keys versus six (the rear panel Fn button equates to the top deck one on the X-T1, and the X-T10 combines the separate buttons that the X-T1 has under the front and rear dials with the dials themselves, as they have a push-to-engage action for those functions). 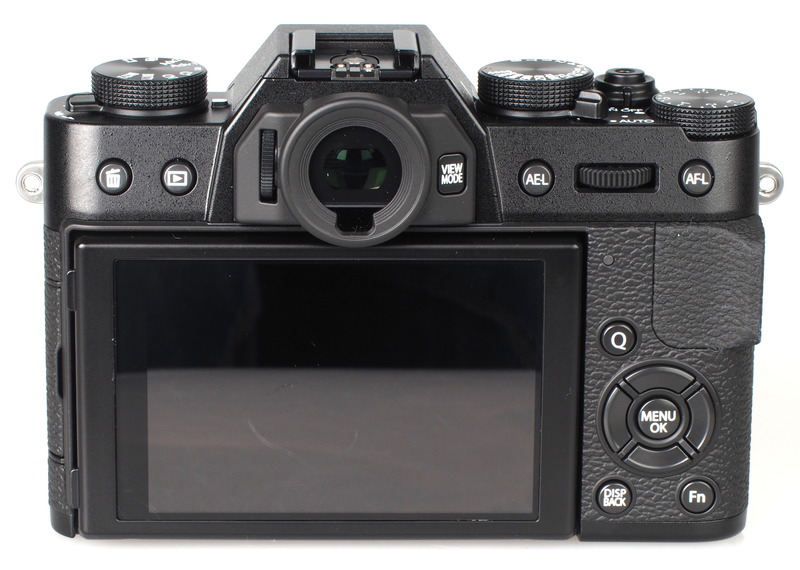 One could argue that the X-T10 needs this extra customisable button facility, since ISO is an obvious one to allocate, as it lacks the physical dial for ISO that the X-T1 has (some would argue that it is a good thing to lose, though!). I agree that the small exit pupil of the X-T10's EVF and the lower magnification makes it seem a little on the small side, especially compared with the extremely large version of the X-T1. The X-T10's EVF has a new feature, auto-brightness (which can be overridden if desired) - I find that it defaults to a view a little on the dark side for my preferences. It's worth noting that despite its rubber-like appearance, the X-T10's viewfinder "eyecup" (which is very shallow) is in fact hard plastic (it's just finished with velvety, "soft touch" varnish) and has no way of attaching an alternative eye cup. The X-T10's viewfinder and LCD graphics are different to previous models such as the X-T1 - fonts are generally smaller (which is perhaps a slight problem with the EVF) and the main data displays more horizontal, with pop-up menus less prone to cover as much of the scene. On the other hand, the amount of data shown on the data-only display of the LCD and the most detailed playback display seems slightly more comprehensive than its predecessors. I find the X-T10's jpgs seem to be exposed up to around a stop darker than the X-T1 (at least for my examples), which gives quite attractive results - it seems to be a difference in the way the evaluative meter is tuned. 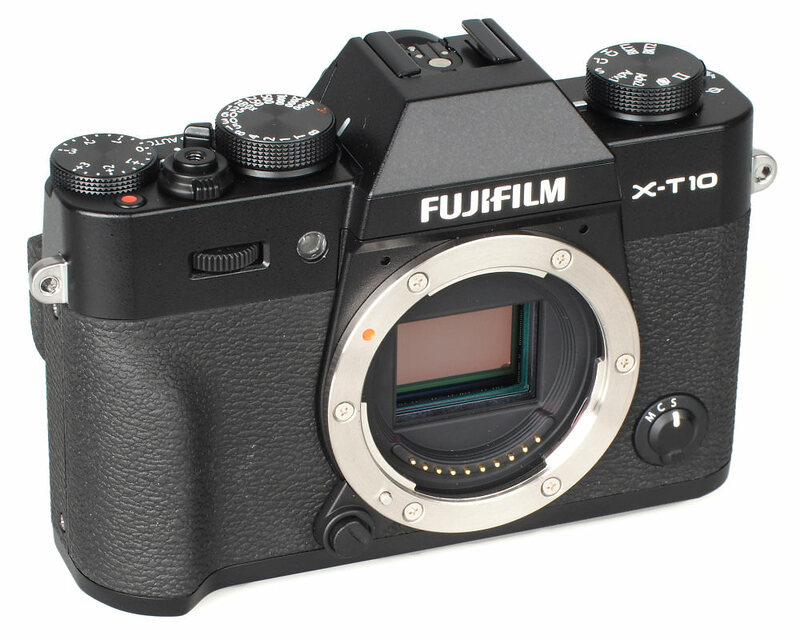 Like the X-M1 and X-A1/2, the X-T10 adds options to the operation of the stabilisation system of motion detection if required, a feature which doesn't appear on "higher" models like the X-T1. The X-T10 also, handily, has THREE individually customisable Auto ISO settings, versus one on the X-T1. On the other hand, compared with the X-T1, I do find that the X-T10's pressable front and rear dials feel rather fragile - they have a very light action indeed which can be a little indecisive, sometimes turning when I only meant to press. The continuous/tracking AF target group becomes smaller in both cameras because that is where the PDAF detection points are on the sensor. Both the X-T10 and the X-T1 when using the new firmware version 4 allow us to set shutter speeds the "other" way as an alternative to the physical shutter speed dial - you can turn the shutter speed dial to T and set the shutter speed, through the entire range, with the front or rear dial, as you prefer (swappable in the customisation). This way, you can use the camera in shutter priority or manual mode more in the manner of cameras which have P, S, A, M mode dials in place of shutter speed dials and aperture rings, which can be faster than the traditional manner of using a shutter speed dial - and many people are used to the more modern manner these days. This is a nice inclusion. The X-T10 also has that instant full-Auto switch under the shutter speed dial, which can be handy, particularly as getting back to program or aperture priority mode takes longer on the X-T10 - because it does not have a lock button on the shutter speed dial, it does not turn through the gap between the red A position and the opposite end of the shutter speed range, B. This means that to use the front/rear dial mode of setting shutter speeds, you need to turn the shutter dial through 15 firm click stops first to get to T, and 15 back again to get to A when you have finished. Conversely, the X-T1 has a fully-rotating shutter speed dial with a lock on the A position, meaning that this manoeuvre takes only two click stops in either direction, whilst holding the lock button. What about the actual photos? Which is why you have a camera! [quote]What about the actual photos? Which is why you have a camera! [/quote] Assuming that might have been directed at me, well - I thought I'd just cover some of the finer points of handling/differences between the X-T10 and X-T1 for now, since I've had the camera for literally a few days (and mostly I've been at work, so unable to use it for actual photography). As I mentioned, I find the straight out-of-camera jpgs rather pleasing - as with other X-series X-Trans sensor cameras, but there seems to be a tweak to the bias of the multipattern metering (and perhaps the image processing) leading to more protection of the highlights than hithertoo, at least with my example, which (for me) gives improved results as I tend to prefer darker skies etc. Given your earlier comment in this review thread, I guess that may conceivably mean that the X-T10's exposure bias would be even less to your liking than the previous ones. Quote:What about the actual photos? Which is why you have a camera! Assuming that might have been directed at me, well - I thought I'd just cover some of the finer points of handling/differences between the X-T10 and X-T1 for now, since I've had the camera for literally a few days (and mostly I've been at work, so unable to use it for actual photography). As I mentioned, I find the straight out-of-camera jpgs rather pleasing - as with other X-series X-Trans sensor cameras, but there seems to be a tweak to the bias of the multipattern metering (and perhaps the image processing) leading to more protection of the highlights than hithertoo, at least with my example, which (for me) gives improved results as I tend to prefer darker skies etc. Given your earlier comment in this review thread, I guess that may conceivably mean that the X-T10's exposure bias would be even less to your liking than the previous ones. Thanks for the reply. But for you the problem of the blacks having no detail is not a problem? Some of the images I have seen can look very good but the 'blackness' bothers me. And so far I have seen very,very few images which do not have that blackness in them. I love blacks in images. Interestingly, I was reviewing some 3 year old pics taken on a Canon 60d and using the shadows slider in LR to bring up the (too dark) shadows in some interior shots. 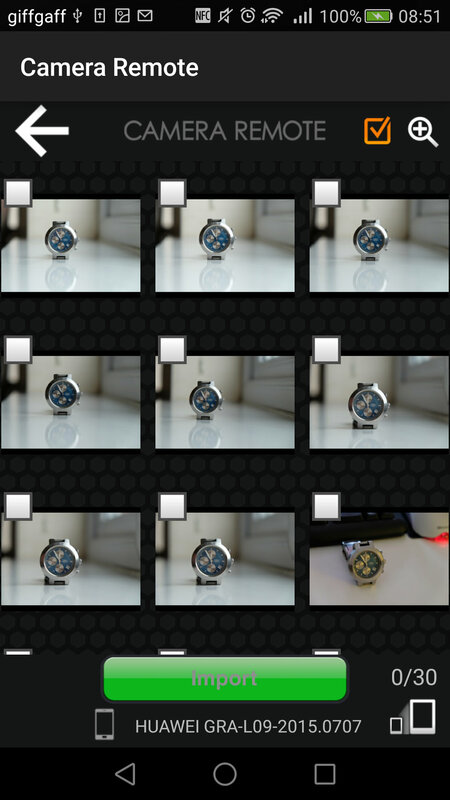 I do this routinely with raw images from my Fuji XT1 and XE1. Unfortunately this resulted in a lot of colour and luminance noise from the Canon pictures, indicating just how far current cameras have improved in this area. Basically you can do a reasonable HDR adjustment on one picture without the need for any special software. I doubt if Fuji is alone in this but there seems to be a good deal of latitude in the current crop of Fuji cameras. I'm almost tempted to swap my XE1 for the XT10, but as its the same processor etc it's hardly worth it. The dark shadows can be adjusted in the camera settings by adjusting the dynamic range and shadow tone settings. Fuji film give you enough settings to tailor the results to your liking.